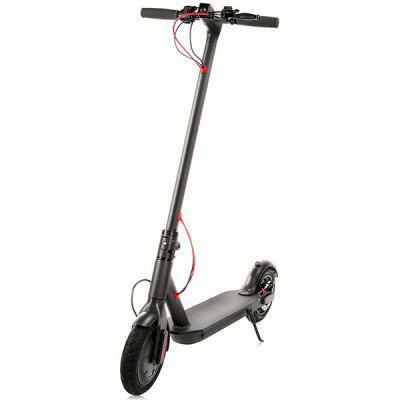 This scooter adopts high safety 18650 Li-ion battery, 25km mileage, excelled in CE, FCC, MSDS and UN38.3 tests. With BMS technology, six battery protections. Advanced E-ABS braking system in both front and rear wheels, 4m braking distance. Quick-folding, lightweight aluminum alloy body with fixing hook, convenient to store and portable to carry everywhere and use it anytime. Lighting system, anti-slip tire and other features are waiting for you to explore! Want to be notified when the Rcharlance S8 5.2Ah Folding Electric Scooter ( EU ) gets even cheaper? Make sure you snag the best price by entering your email below. We'll email you when the price drops, free! We're tracking the price of the Rcharlance S8 5.2Ah Folding Electric Scooter ( EU ) every day so you know if that deal is really a steal! Check back for to check the best price for this product - and whether its current sale price is really the cheapest it's been! No Rcharlance S8 5.2Ah Folding Electric Scooter ( EU ) coupons found!